The Rangers play their 26th game of the 2018-19 season and conclude a home-and-home set tonight, Nov. 29, against the Ottawa Senators at Canadian Tire Centre (7:30 p.m. ET - TV: MSG Network, Radio: ESPN 98.7 FM). The Blueshirts have earned at least one point in 11 of the last 14 games (10-3-1 record); the Rangers rank second in the NHL in points (21) and are tied for second in wins (10) since Oct. 30. New York has earned at least one point in 14 of the last 20 games (12-6-2 record) and in 15 of the last 22 games (13-7-2 record). 2018-19: Tonight's game is the second of three meetings between the Rangers and Senators, and the only meeting between the two teams at Ottawa. The Rangers have posted a 1-0-0 record (1-0-0 at home; 0-0-0 on the road), following their 4-2 win on Nov. 26 at MSG. 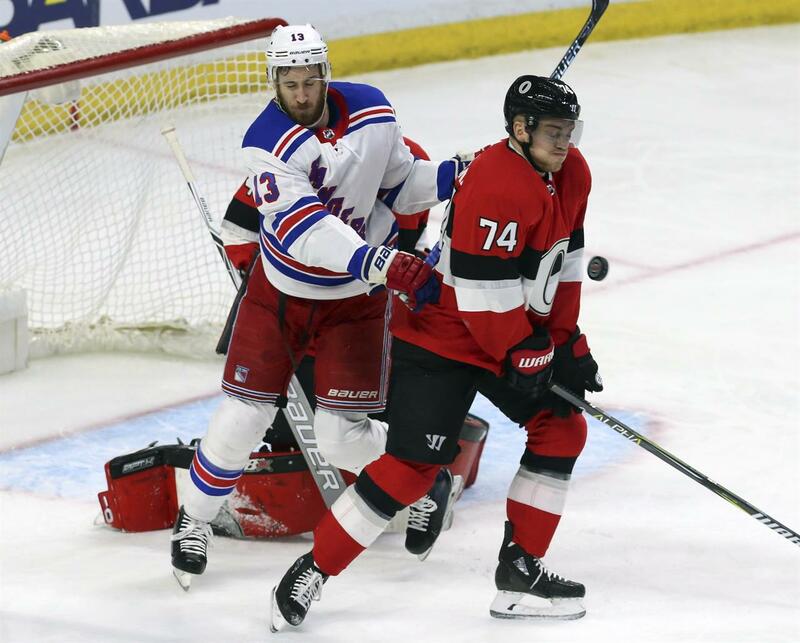 Mika Zibanejad registered two points (one goal, one assist) and Henrik Lundqvist made 29 saves to earn the win. Following tonight's game, the Rangers and Senators will face each other on the following date: Apr. 3 (at MSG). The Rangers have won nine of 16 meetings against the Senators since the start of the 2013-14 season (9-7-0 record). New York has allowed two goals or fewer in seven of its last 13 games against the Senators. The Rangers have only allowed one power play goal in their last nine games against Ottawa (21-for-22; 95.5% over the span). Henrik Lundqvist is the Rangers' all-time leader in appearances (41) and wins (17) against Ottawa. Lundqvist has appeared in more games against the Senators than any other Ranger (skater or goaltender) in franchise history. Henrik Lundqvist - 41 GP, 17-20-3, 2.16 GAA, .928 SV%, 2 SO - Lundqvist has allowed two goals or fewer in seven of his last 10 appearances against Ottawa (5-5-0 record, 2.13 GAA, .925 SV%, 1 SO over the span). Lundqvist has appeared in more games against the Senators than any other Ranger (skater or goaltender) in franchise history. Mika Zibanejad - 4 GP, 4-1-5 - Zibanejad has recorded a goal/point in each of his four career games against his former team. Chris Kreider - 16 GP, 5-7-12 - Kreider has tallied 12 points (five goals, seven assists) in his last 13 games against Ottawa, and he has notched a point in each of his last five games against the Senators (one goal, four assists). Kevin Shattenkirk - 13 GP, 2-7-9 - Shattenkirk has registered a point in five of his last eight games against the Senators (two goals, five assists), including an assist in three of his last six contests. Kevin Hayes - 13 GP, 2-6-8 - Hayes has tallied a point in four of the last six games against the Senators (one goal, three assists) and has notched a point in seven of 13 career games against Ottawa. Through 25 games this season, 21 different players have tallied a goal for the Rangers. Prior to 2018-19, the last time the Rangers had 21 different players register at least one goal through the first 25 games of a season was 1988-89. The Blueshirts are one of only two NHL teams that have 21 different players who have tallied a goal thus far this season (along with Vancouver). Only nine NHL players who are in their first or second NHL season have recorded 13 or more points this season, and the Rangers are the only team that has two of those players (Brett Howden and Neal Pionk). Pionk leads all NHL defensemen who are either in their first or second NHL season in points in 2018-19 (15). In addition, the Rangers are one of three NHL teams (along with Chicago and Ottawa) that have at least two rookies who have tallied nine or more points this season (Howden and Filip Chytil). Rangers rookies have recorded 12 points (seven goals, five assists) over the last eight games. The Rangers had four players 20 years old or younger in their lineup on Nov. 24 vs. Washington (Lias Andersson, Filip Chytil, Brett Howden, and Tim Gettinger). According to NHL Public Relations, New York had four players 20 years old or younger play in the same game for the first time since Dec. 5, 1984. The Rangers are the only team that rank tied for fifth or higher in the NHL in both hits and blocked shots this season (rank third in blocked shots - 407; are tied for fifth in hits - 612). The Blueshirts have registered 73 hits over the last two games, including a single-game season-high 42 hits on Nov. 24 vs. Washington. New York has posted a 9-3-1 record in November this season. The Rangers have earned 10 or more wins in November in six different seasons in franchise history (most recently in 2016-17), and their single-season record for wins in November is 11 (1993-94). The Rangers have tallied the first goal of the game in nine of the last 13 games and in 14 of 25 contests this season. The Blueshirts have posted a 7-5-2 record when recording the first goal of the game in 2018-19. Henrik Lundqvist has been selected as one of the game's Three Stars in 10 of his 19 appearances this season. Lundqvist has made at least 30 saves in 11 of 19 appearances this season; he has posted a .900 SV% or better in 16 of his 19 appearances in 2018-19, including a .925 SV% or better in 11 of those appearances. He leads NHL goaltenders in games with a .900 SV% or better this season, and he is also tied for second among NHL goaltenders in games with a .925 SV% or better in 2018-19. Lundqvist has posted a 3-1-0 record, along with a 2.00 GAA and a .940 SV% over his last four appearances. Since he was recalled by the Rangers last season (Feb. 9, 2018), Neal Pionk is tied for 15th among NHL defensemen (min. 50 games played) in points per game (0.57). Pionk has tallied a point in five of the last eight games (one goal, five assists) and in eight of the last 12 games (four goals, five assists), and he has recorded 15 points (four goals, 11 assists) in the last 19 games. He is tied for third among NHL defensemen in power play points (11), is tied for fourth in power play assists (nine), and is tied for fifth in primary assists (eight) this season. Filip Chytil posted a five-game goal/point streak from Nov. 12 vs. Vancouver to Nov. 21 vs. NY Islanders (five goals over the span). He became the first teenager to post a five-game goal streak in franchise history, and he also became the first Rangers rookie to post a five-game goal streak since Petr Prucha in 2005-06. Among NHL players who are either in their age 18 or age 19 season in 2018-19, Chytil is tied for first in games played (25) and is tied for second in goals (five). He is tied for fifth among NHL rookies in goals in 2018-19. Chris Kreider has tallied a point in six of the last nine games (six goals, four assists). In addition, he has notched eight points (five goals, three assists) over the last seven games and has posted a multi-point game in three of the seven contests. During the Rangers' 10-3-1 stretch since Oct. 30, Kreider has recorded 14 points (nine goals, five assists) in the 14 games and is tied for sixth in the NHL in goals over the span. The Rangers were 0-for-4 (7:50) on Nov. 26 vs. Ottawa. The Blueshirts have tallied a power play goal in four of the last eight games (5-for-26; 19.2%) and in five of the last 10 games (7-for-32; 21.9%). New York is tied for 10th in the NHL in power play efficiency on the road this season (22.2%; 8-for-36). The Rangers were 2-for-2 (4:00) on Nov. 26 vs. Ottawa. The Blueshirts have not allowed a power play goal against in each of the last four games and have only been shorthanded six times over the span. New York has not been shorthanded more than two times in any of the four games during the stretch. Nov. 28, 1964 - Phil Goyette tallied four points (one goal, three assists) and Camille Henry registered two goals as the Rangers defeated the Toronto Maple Leafs, 4-1, in Toronto. Rod Seiling registered three points (one goal, two assists), including his first career NHL goal, while playing against the team that traded him to the Rangers in February of 1964. Jacques Plante stopped 24 of 25 shots he faced to earn the win. Nov. 28, 2014 - Martin St. Louis recorded his 1,000th career NHL point by tallying a goal as the Rangers defeated the Philadelphia Flyers, 3-0. Nov. 29, 1927 - The Rangers defeated the defending Stanley Cup Champion Ottawa Senators, 2-1, in Ottawa. Rangers captain Bill Cook tallied the game-winning goal in the contest. The win was the Blueshirts' first all-time win in Ottawa against the original Ottawa Senators franchise, which was in existence from 1917-18 - 1933-34. Nov. 29, 1962 - Andy Bathgate registered his 229th career goal as a Ranger, breaking a tie with Bill Cook to become the franchise's all-time leading goal scorer. Bathgate added two assists, Camille Henry recorded three points (two goals, one assist), and Gump Worsley stopped all 35 shots he faced to earn a win and a shutout as the Rangers defeated the Detroit Red Wings, 5-0. Nov. 29, 1991 - Brian Leetch began a franchise record 15-game assist streak by tallying two points (one goal, one assist) in a 5-4 win against the Buffalo Sabres. Nov. 29, 1998 - In the Rangers' first game against the Nashville Predators, Wayne Gretzky tallied three points (one goal, two assists) as the Rangers earned a 5-1 win at MSG. Rangers are going with 11 forwards and 7 defensemen. DQ said we may see one of the D playing up on a wing, but he wouldn't identify which D that would be. It's not DeAngelo, however. Also, Lundqvist is in goal tonight. Fire the coach. Been awhile since I heard that. Carry on Dave. Location: NJ Is it me or the Rangers play the Senseless every other game. Is it me or the Rangers play the Senseless every other game. Not sure I like the 7 defensemen thing. Perhaps the issues with Frodo or Vlad are short term enough that Quinn doesn’t want to use a call-up. I’d rather see Nieves brought up and give Lias a shot on line 1 or 2. But that’s just me. Location: USA Very unattractive team sport wise . Location: New Jersey DQ says a D is going to play forward... Shatt? Smith is the new Jimmy Roberts. Location: NJ Gresh sometimes played forward, I remember this back in the day. Also, Fedorov played D when needed. ^^^^As I pointed out earlier it’s Smith. You have jinxed Strome by creating a dedicated thread about him. The bad Rangers have shown up tonight. Location: AV is gone How much do you think Ottawa hates Mike Hoffmans girlfriend?